This page presents perspectives on and resources for engaging 2YC students in field experiences - opportunities, challenges, benefits. Essays from 2YC faculty showcase different examples of using fieldwork in 2YC courses while teaching activities demonstrate particular things that have been effective in this context. These materials have been developed by two-year college faculty in a number of settings for several different projects. On the Cutting Edge has gathered extensive information on Teaching in the Field across the curriculum. On this one day field trip, students will be exposed to some general introductory field methods by examining an active landslide. They will examine the relative ages of the units involved as well as identify the types of materials involved (bentonite, basalt, colluvium and alluvium). They will make an assessment as to what type of motion is occurring as well as a prediction for what types of hazards this may pose to the surrounding community. Using quantitative field methods to study shoreline erosion of a barrier beach. Students profile a beach and mechanically process sediment to document the changes along a shoreline. One of the biggest challenges we face as community college instructors is preparing our students for careers; this is especially true in geoscience fields because people are generally not familiar with the discipline and they do not typically know anyone who is a geoscientist. 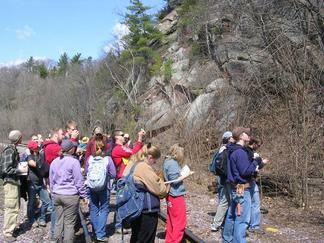 Further, community colleges do not typically have research programs where students can gain exposure to geoscience research and/or field applications. There are a couple of items I'd like to touch on in this essay. Given the breadth of possible questions, I think it would be fair of me to mix and match a bit. So I intend to cover three things here, from general to specific: (1) quality, (2) field work, and (3) blogging.